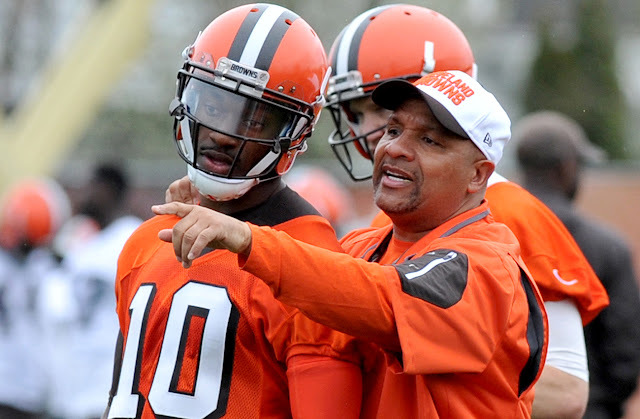 Robert Griffin III got the first reps with the first-team offense as the Browns opened training camp Friday, but Browns coach Hue Jackson has been adamant that the team does not yet have a starting quarterback. As he did throughout the spring, Griffin said he’s just “having fun” and whatever level of uncertainty may exist hasn’t affected his thinking or his work. Jackson has said he’ll name a starter before the team plays its first preseason game, and since the spring it’s seemed like Griffin’s job to lose. Friday marked the first of 11 practices the Browns have on their schedule before their Aug. 12 preseason opener at Green Bay. “At the end of the day you come out here every day having to work to be the guy, to be the best,” Griffin said. “Even when they name the starter you still have to come out here and work and prove it every single day. Nothing’s ever going to be given to you.